Once an iPod® is connected, the mode will automatically start and begin playing an iPod® song. iPod®s with unsupported communication protocols may not properly operate in the audio system. Press the key to move to the previous or next song. Pressing the key after the song has been playing for 2 seconds will start the current song from the beginning. Pressing the key before the song has been playing for 1 second will start the previous song. Slight time differences may exist depending your iPod® product. 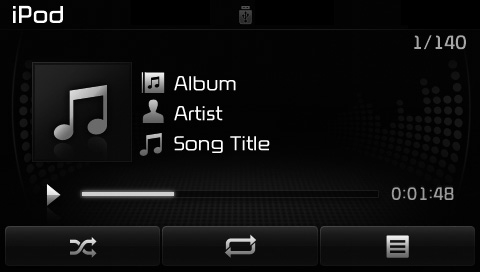 While playing, press and hold the key (over 0.8 seconds) to rewind or fast-forward the current song. Turn the TUNE knob left/right to search for the desired category. 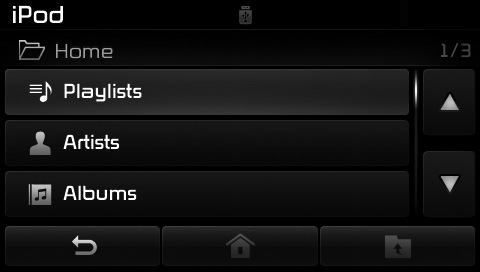 Once you find the desired category, press the TUNE knob to select and play. There are eight categories that can be searched, including Playlists, Artists, Albums, Genres, Songs, Composers, Audiobooks and Podcasts.